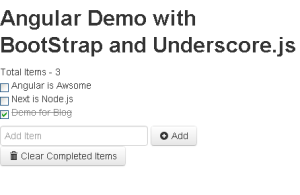 In this article, I will demonstrate how to use AngularJs framework to create simple application. For look and Feel we are using Tweeter’s Bootstrap library. Output of above code is already shown above. Now Lets understand above code and few basics of AngularJs. How to define variables ? Lets take other example to understand this. Working demo of above example. What is Angular application or “ng-app” ? Your web page can have one or many application defined by tag “ng-app”. This represents one unit of application which will have its own controller. In order to use AngularJs, you must need to have atleast one ng-app. 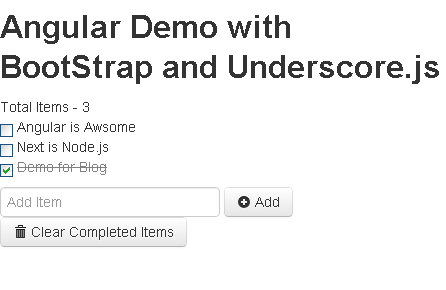 Only one AngularJS application can be auto-bootstrapped per HTML document. The first ngApp found in the document will be used to define the root element to auto-bootstrap as an application. Controller will decide that what action has to perform on part of your web application. It Controls flow of execution and logic. Inside Controller “ItemCtrl”, we have defined items available for List , also we have defined two methods named add() and clear(). This is defined using directive “ng-model“. This is Engine Directive used to perform two way Binding of variable between View and Controller. As shown in above code ; When we click on Checkbox, “ng-modal” directive will make sure that “done” attribute of item also set accordingly both side (Controller and View). In Same way When any value is added in Text Box, ng-model “itemToAdd” makes sure that it is available to Controller. How to iterate over List ? “ng-repeat” is savior. Last but not least, “ng-click”. Thanks Harshit. I am going to add few more article on same topic and little bit similar to @Mohit’s but not in Salesforce; so will provide reference to your post in those articles.